Bursting with favourite spring flowers, this vibrant gift encapsulates the very best of the spring flower season. 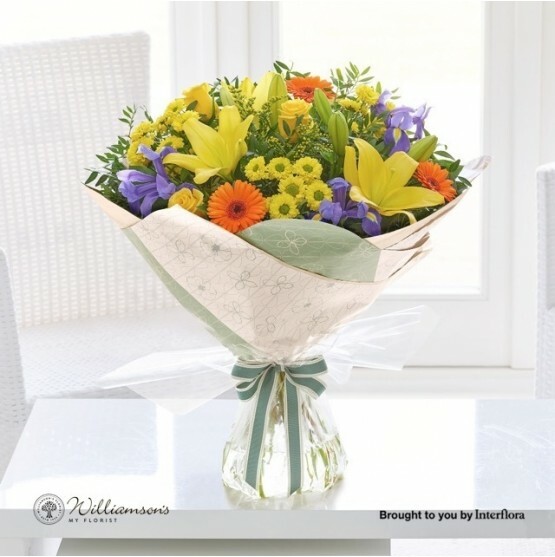 Williamsons have chosen the bright, contrasting colours to create this cheerful spring bouquet for UK wide same day delivery. Featuring cerise carnations, yellow daffodils, yellow/gold germini, blue iris, cream Asiatic lily, light pink spray carnations, green spray chrysanthemums, all expertly hand-tied with salal tips and finished with spring gift wrap and ribbon.